Role: Project design leader, space planning, concept design & documentation, including interior design, services engineer co-ordination. Bravura Solutions are a leading global supplier of finance software, business & strategic consulting services. Bravura’s new Sydney office is a part-renovation of an existing fitout. The Client’s brief was to utilise the existing meeting rooms, offices and computer room as much as possible, and relocate their existing workstations. Design elements such as film design and reception look and feel were established successfully in the Melbourne fitout and replicated in the front of house areas here. However, one area that was to be fresh and new was the breakout area. 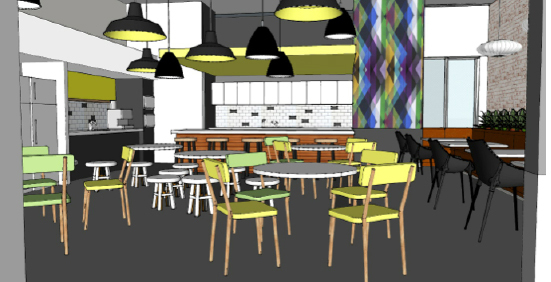 The Client’s brief was to create a cafe style feel. This was achieved by using natural & raw finishes such as plywood, a concrete textured floor, and a colour palette that departed away from the corporate scheme.